The recent developments in Athens are marked by a retreating state, overwhelmed by the task of implementing the EU-Turkey deal as well as the obligatory provision of accommodation and nutrition to ~57,000 ‘persons of care’. In the city of Athens, the everyday subsistence of people, who planned to merely pass through Greece on their way up north, has largely fallen back on self-organised autonomous structures aided by anti-state activists and non-state volunteers. Various squats (occupied empty buildings, most of which are owned publicly) with different organizational features and political aims have popped up on the map. Some serve the need of accommodation as housing squats, others function as social centres, with its activities ranging from the free (re)distribution of goods such as clothing and food items and housing self-organised kitchens-crews to the creation of spaces for political organizing and (legal) info-points. Most of these squats can be found in the neighborhood of Exarchia, with its history of autonomous self-organisation and a strong anarchist movement. But there are exceptions to this rule (e.g. City Plaza Hotel) and the following is an attempted short overview about the numerous squats. 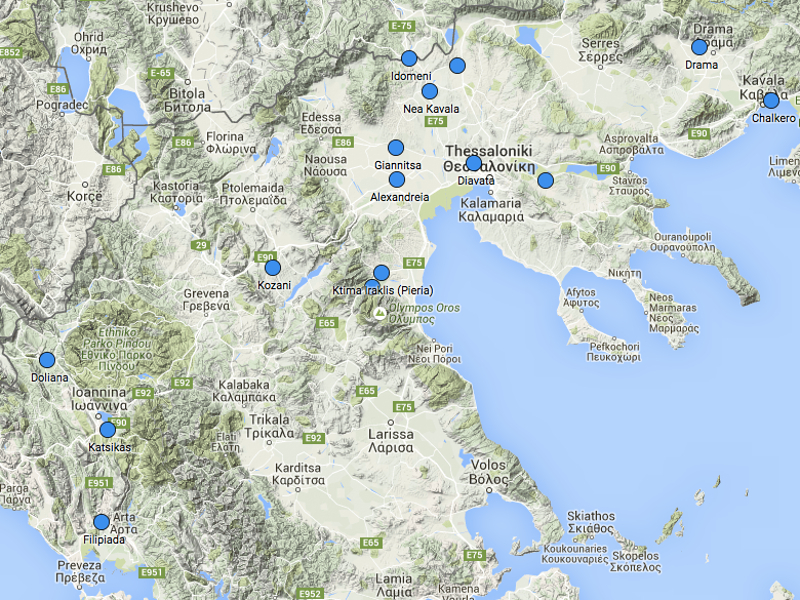 Some are well-known, others might be completely unheard of outside of Athens, some have opened up recently in the last few weeks, others have been running for months. It is neither an exhaustive list nor a complete and detailed account of events, but rather an attempt to communicate the very basics about different squats and solidarity-projects and their usefulness vis-à-vis the substandard and insufficient government-run camps. City Plaza Hotel (Acharnon 78): This squatted hotel might be the most well-known squat in Athens. Since our last entry describing this inspiring project, a new fundraising campaign, entitled ‘The Best Hotel in Europe’ has been launched. The maintenance of the hotel is ensured by its own residents and solidarity-activists, and the hotel which was squatted since April is currently housing 400 people. Language classes, a pharmacy and medical care, a hairdresser, a self-run kitchen and bar are all a far cry from what others experience in government camps. M. stressed the difference: “No-one here would ever move to a government camp. We know they are worse. Look at my children here, they are playing and they are happy. In a government camp they would not be happy.” The hotel is located outside of Exarchia and close to the office of the far-right party Golden Dawn, but regular self-organised security patrols and night-shifts ensure the safety of the hotel. School 2 – 2o Filoxenio Prosfigon (Sourmeli 1): Squatted for a couple weeks, the 2nd School to be used as a refugee-squat is currently housing ~350 people, including over 100 children. There is a self-organized kitchen with a chef from Syria, and the everyday life of the project is run by its residents. This school is in the process of receiving a gym-equipment set from the Port Piraeus. Any organized activities for the children living at this school are welcome. Politehnio (on the university campus): One part of the politehnio university campus is squatted and currently houses over ~100 people. Its assembly has affirmed a strict anarchist position and the project rejects any co-operation with the state or NGO actors. Themistokleus 58: Squatted since January, this self-declared non-volunteer squat is self-organised and does not see itself as any public service. Its politics are similar to the Politehnio, by firmly rejecting both state agencies as well as NGOs. Themistokleus 96: Squatted this month, this building lacked some crucial repair-work, but there were plans to turn it into a housing-squat for people with and without papers, as well as a place for political dialogue, planning of political actions and co-operation between different assemblies. Unfortunately, it was raided by the police on the 14th of June, resulting in 3 arrests made inside the squat. They are all currently free again, but they face charges of trespass (this building is private property and not in public ownership) and another charge related to refusing to give their fingerprints to the police. The squat was re-squatted shortly after the raid for a couple of days, but now the building is empty again. Strephi Squat (Anexartisías): Up on the Srephi hill over Exarchia, a squat only for women opened up a couple of weeks ago. Its upper floors were living space for both international solidarity-activists with papers and refugee-women and their children, while the plan for the ground floor flat was to make it into a social centre, with events such as film-screenings and queer bars as potential ideas. However, this project was violently interrupted by a police eviction. School (Merlie Oktaviou 19): This school has been squatted since March and is currently housing ~400 people. It is a project of self-organization, a shelter run by those seeking shelter. The school’s entire drainage system was repaired by its residents, and it regularly hosts activities for the large number of children living there. Hotel Oniro (Spyridonos Trikoupi 57): This new housing-squat was opened in the aftermath of the protest on the 16th of June (described below) and is housing ~130 people. It is currently collecting various donations in order to ensure livable conditions and enough resources for a long-term duration of this new hotel-squat. Dervenion 56: This social centre has been occupied and functional since last autumn. It houses a kitchen-crew, which currently supplies meals to the Notara26, the Politehnio and the School squats at regular intervals. Its assembly is based on anti-authoritarian principles and rejects any co-operation with NGOs. It does not serve as a housing squat, but prefers to function as a hub for various activities, such as the kitchen, and plans to expand its project to offer the space for workshops and skill-shares. It also enabled the translation of the anarchist newspaper from Greek into Arabic. Cat’s Spirit (Zoodochou Pigis 119): This squat is meant to be a base for both anarchists and refugee activists, but also for people in emergency housing need, since April. It had contact with a self-identifying owner on the 6th of June, and it is on high alert due to possibility of a potential eviction which could happen at any point in the future. Steki Metastanon (Tsamadou 13-15): This social centre in the heart of Exarchia has been functioning as a base for migrants and refugees in Athens for many years. It hosts collective cooking session each weekend at noon, in addition to numerous language lessons (Greek, German, English, French, and Italian), and theatre classes (each Thursday). Its access to the Elliniko warehouse and its own storage space is used by various refugee-squats, and its café serves as a place of encounter and an outdoor area as the preferred hang-out spot of many. 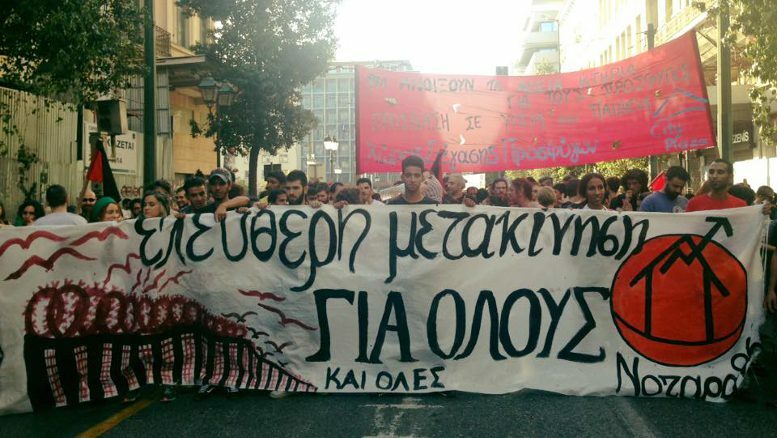 Protest on the 16th of June: Last Thursday a protest of approximately 2000 people, including refugee families from camps and various solidarity initiatives, assembled at Omonia in the evening before marching to parliament on Syntagma Square and back. The call-out for the march entitled ‘We live together – We fight together’ was organised by the residents and assemblies of many refugee-squats, such as the City Plaza Hotel, Notara26, the two school squats, Kanniggos, Asirmatos, and Votanikos Kipos Petroupolis; some of which joined the protest by organising small feeder marches from their individual locations. The atmosphere was one of defiance and endurance, as the protest was rallying against deportations, detention centres, and government camps, coupled with the demands of freedom of movement for all, open borders, political asylum, and residence in the urban fabric. At the end of the march a group opened the Oniro Hotel in Exarchia as a new refugee-squat. To sum up, although the squats offer safety and hope to its residents the general situation is one of waiting, insecurity and frustration. Athens is obviously not the intended destination for most of the residents of the squats, yet the squats tend to provide more dignity than the government camps. It seems that the eviction of the camp at Terminal E1 in Port Piraeus is looming, and yet the government fails to provide adequate alternatives to self-organised camps or squats. It is more than likely that more squats will open up this summer, as people grow tired of waiting and choose to take their accommodation needs into their own hand. If the state chooses to evict these squats, it continues its hypocrisy due to the conditions of its own camps compared to the often superior conditions of the squats. Furthermore, the residents of different squats we spoke to frequently mentioned that it is not merely the better conditions of the squats, as opposed to government-camps, it is also the qualitative difference of feeling free, autonomous and empowered by running and self-organising the needs of everyday life in the squats.